uses a system of long gliding strokes, kneading, friction, percussive, and shaking motions or vibration techniques on the more superficial layers of muscles. Swedish Massage is intended to vibrate glands and organs as well as move lymph. It is primarily for full-body sessions and promotes general relaxation. It is effective for most ailments, because massaging the skin, the body's largest organ, sets up a chain reaction that produces a positive effect on all layers and systems of the body. It affects the nerves, muscles, glands, and circulation, and promotes health and well-being. Swedish Massage also relieves muscle tension, reduces anxiety, strengthens the immune system, improves blood circulation, detoxifies and balances the nervous system. and works on the neuromuscular tissues to tune the body and mind. The process of digestion, chemical reactions in the cells and mental and physical work all produce waste and toxic materials, which accumulate in the tissues. These byproducts remain in the tissues and hamper further nourishment of the component cells. They can also contribute to spasms in the muscles and nerves. This treatment cleans the waste and toxic materials through deep tissue manipulation. It frees up the system allowing for the smooth function of the body and mind and the efficient working of the tissues themselves. It also eliminates the spasm in the muscle and nerves to help alleviate chronic pain. It is said to inhibit the aging process, overcome stress and fatigue, eradicate headache and back pain, promote strength and tone up the nervous and muscular systems by nourishing the body and mind. is a tailored treatment which combines several techniques, that meet holistically the specific needs of your body at this time. is a natural and a very effective method to reduce the appearance of cellulite. Cellulite is a condition that occurs in most women, where the skin of the lower limbs, abdomen and pelvic region become dimpled. It is more common in aging women, although in some cases, girls as early as fourteen can start to develop cellulite. The causes of cellulite are: hormonal factors, genetic factors, diet , lifestyle; smoking , lack of exercise and stress. Cellulite Massage is a deep fast and invigorating massage technique that increases blood circulation , bringing more oxygen in to the affected areas of the body which in turn dissolves localized fat deposits and helps the removal of waste products (toxins) by increasing lymphatic circulation. 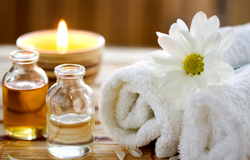 Massage is known to help alleviate the condition of a wide range of ailments. It has been shown to increases pulmonary function in asthmatics, decrease glucose levels in patients with diabetes, and increase natural killer cells in HIV and cancer patients. It also reduces blood pressure in stroke patients and those suffering from alcohol detoxification symptoms. It relieves temporomandibular joint dysfunction. Massage can help with spastic diplegia resulting from cerebral palsy. Massage also has beneficial effects for mental health in that it reduces stress and decreases feelings of anxiety and depression , and improves general well being. - I have received full body massages from Shlomit. Her Massages are pure pampering and relieves any aches and pains I may have. I feel relaxed and have a fantastic nights sleep following her massage. She is absolutely a fantastic person and a true professional, listens to what your issues are, and gets to work. She is genuinely a fantastic person.